Arzep Nasal Spray (Azelastine) is a second generation anti-histamine which has demonstrated effectiveness in the management of hay fever and year round allergies. It exhibits antiallergic, anti-inflammatory and antihistaminc properties, and is fast working (some patients have reported improvements in symptoms 30 minutes after use). Arzep Nasal Spray (Azelastine) is a second generation anti-histamine which has demonstrated effectiveness in the management of hay fever and year round allergies. It exhibits antiallergic, anti-inflammatory and antihistaminc properties, and is fast working (some patients have reported improvements in symptoms 30 minutes after use). This makes it a common first line treatment for mild to moderate rhinitis which is persistent, when these allergy symptoms are triggered by exposure to pollen (hay fever or seasonal allergic rhinitis), pet allergies or perennial allergic rhinitis (also called year round allergies). When administered intranasally, this medicine acts as a histamine H1 receptor antagonist, and it may also inhibit the release of substances from the mast cells which are known to contribute to the inflammatory response. By acting on the membranes in the nose, it stops histamine from attaching to its receptors, which helps prevent the allergic response responsible for rhinitis. This allows for effective allergy control, thereby providing sufficient relief from the common symptoms of allergies. 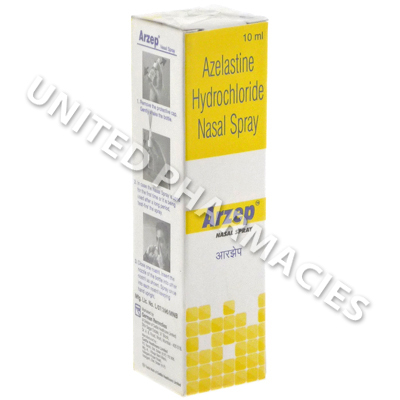 Arzep Nasal Spray (Azelastine) is intended for intranasal administration. The solution is provided in a special bottle that is equipped with a spray device, used to deliver the medicine directly to where it is needed. Visit your doctor for advice regarding how to use it and the frequency of administration. You may also refer to the product label for further information. Doctors sometimes tell patients to administer a single spray into each nostril twice per day. However, patients should note that this may vary based on individual circumstances. In all cases, only the amount of sprays recommended by the doctor should be used. Ensure that you promptly inform the doctor in charge of treatment if any side effects are experienced. Severe side effects are normally said to be rare. However, you will need medical helps straight away if you suffer from breathlessness, wheezing, blood visible in urine or any other serious side effects that have not been mentioned here. If the medicine has not been fully used 6 months after it has been opened, it should not be used. Discard of any leftover medicine after this time. This spray is only for intranasal administration. Do not spray in the eyes or any other sensitive areas of the body, and never consume it by mouth. Always use Arzep Nasal Spray (Azelastine) as you have been prescribed by your doctor. Never self-medicate or change your dosage without first consulting your doctor. The correct dosage can vary depending on your health, medical history, and the severity of the condition being treated.